I bought one of them….Art Impressions kindly sends me a box of goodies after shows but – I wanted to get this one colored because I love me some funny critters, and wanted to let you know about it asap! Note that these can be used all year round, so I love that about stamp sets that aren’t *for sure* for a holiday – but these cards are most of my valentines to send out this year. First the little otter in a sweater. Oh so cute! 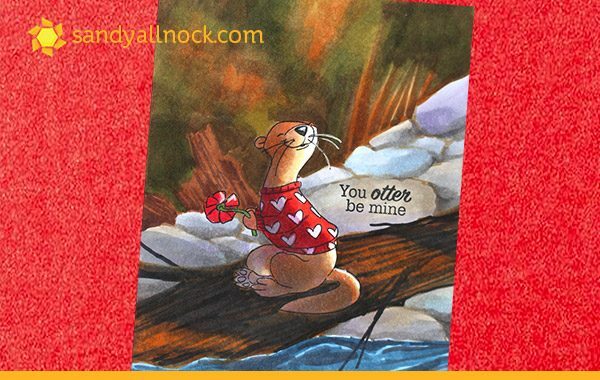 I made him a river rather than ocean otter….and gave him a scene with rocks, trees, and water. 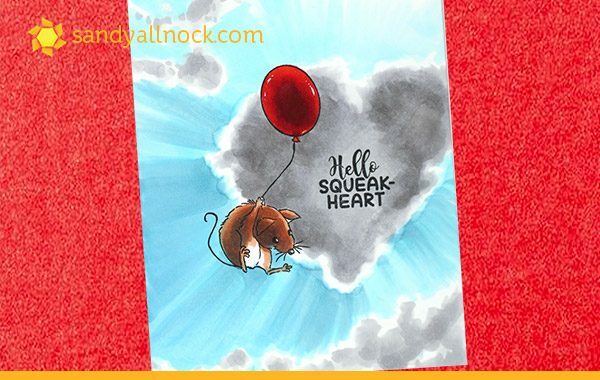 The little squeak-heart mouse – GAH! I wanted him to fly REALLY high so looked up some cloud pics…I saw one of a heart and thought that’d be cute for a card! 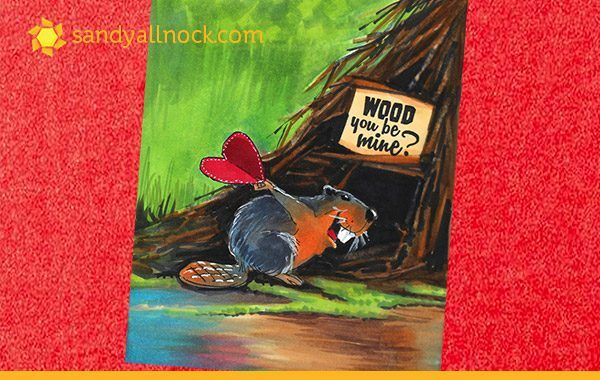 The beaver is maybe using his valentine as wings? Not really sure. But he’s headed into his little beaver den with a sign over it! 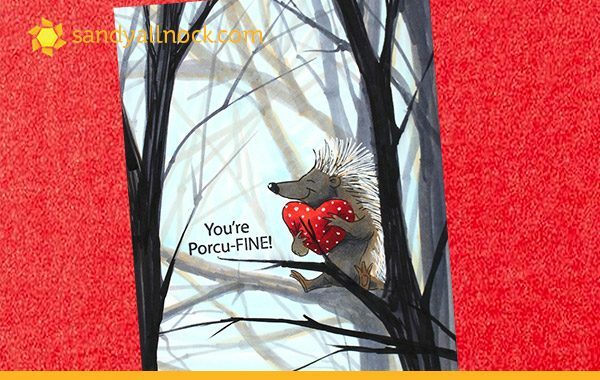 When I looked up porcupine habitats, I laughed seeing them up in trees – wouldn’t that hurt if they fall down!?!?!? But…this little guy is sitting high up in the tree hugging a heart anyway. Let’s hope he stays put! FLASH GIVEAWAY! I have 2 of these Valentine Critter stamp sets (one lightly used now!) to send out tomorrow – so tonight I’ll pick 2 winners from comments! Hoping to get them to the winners in time to use for vday! So adorable! I love your videos Sandy!!! Beautiful cards! Sandy you inspire me! Would love to win this stamp set! These little critters surly make my heart flutter. They are adorable. Thank you, Sandy for the opportunity to win one of them. These are the best valentines ever. You inspire me! Wish I felt good enough yesterday to open up my email. But! Loved all of the backgrounds you gave these cute critters, and thanks for sharing that lovely, heartfelt “movie”. Awww!!! Fabulous colouring!!! Fingers crossed!!! 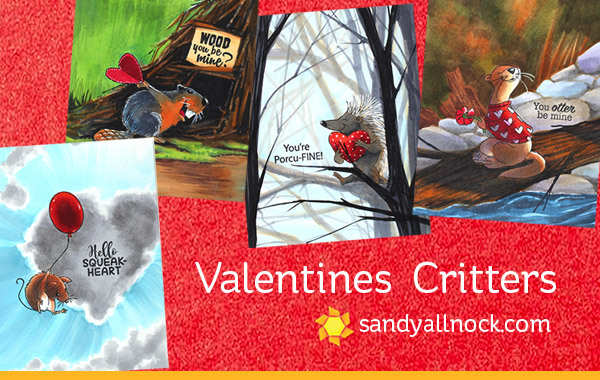 Love love these critters, thanks for the opportunity Sandy! You take cute to the nth degree! Amazing!!! !